Berry Springs is seasonally closed for swimming during the wet season when increased turbidity and risk of saltwater crocodiles entering the system make it unsafe for swimming. PWCNT rangers conduct regular water testing throughout the year to ensure bacteria concentrations are within safe levels. With the recent storm activity consecutive tests show that bacteria concentrations are remaining well above the recommended levels in each of the four public swimming spots. Consistent rains result in other safety issues including flushing and high flows, increased turbidity and crocodile risk. Visitor health and safety at parks and reserves is the top priority. 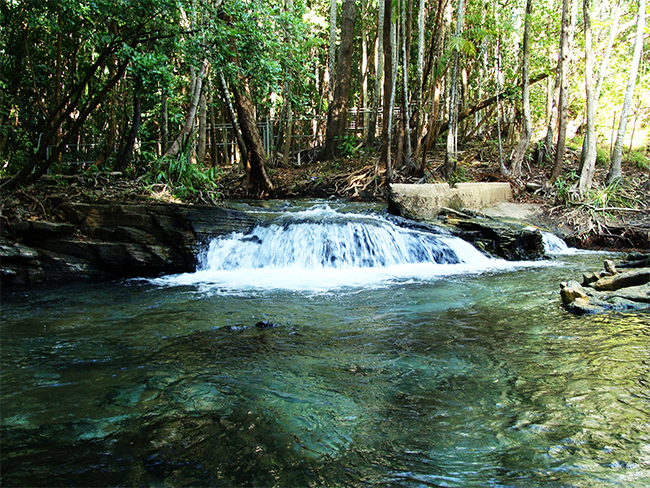 All other facilities at Berry Springs, including the picnic area and barbeques, will remain open to the public, providing visitors with a shady place to stop before strolling the Monsoon Forest and Woodland Walk track. PWCNT urges the public to Be Crocwise when in and around any waterway in the Top End, croc danger is real, don’t risk your life. Berry Springs Nature Park is located 47km from Darwin on Cox Peninsula Road, next to the Territory Wildlife Park and protects much of the Berry Creek catchment.